cool ! naruto-san look cool with the pose ! Now this worth readin' for. Nice mag! Awesome full body shot of Naruto, love this pic. I really like his pose in this pic. 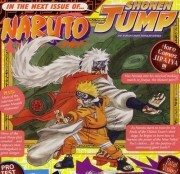 Naruto looks so cool! Thanks for sharing! Believe it! He just shouts it out in this illustration! Thank you very much for sharing.